The Alaska Sleep Clinic is an independent sleep disorder diagnostic center with multiple locations throughout the state of Alaska. ASC helps patients suffering from sleep disorders by diagnosing their condition, arranging treatment options, administering medical equipment, and providing quality follow-up care. Patients either come into the testing facility for an overnight sleep study under the supervision of a sleep technologist, or are issued equipment to take an at-home-sleep-test for diagnosing sleep apnea in the comfort of their own home. The Alaska Sleep Clinic began it's inbound marketing campaign in October 2012. At the time, Kevin Asp, owner of Alaska Sleep, was looking for a way to increase traffic to his website. Browsing through the shelves of Barnes and Noble he came across a book titled Inbound Marketing: Get Found Using Google, Social Media, and Blogs by HubSpot founders Dharmesh Shah and Brian Halligan. "It was serendipitous," says Asp, "I thought I was looking for help with SEO tactics in order to get more traffic to the website, but I quickly discovered there was much more than just getting new viewers to the website than simply tweaking my existing 20 pages. I needed to start producing content regularly." After reading the book, Asp was sold on the power of inbound marketing and downloaded HubSpot's marketing software platform. Looking back on it, Asp counts himself lucky to find HubSpot so early on, "I was very fortunate that my first awareness of inbound marketing was by the very people that had the all-in-one solution to my problems. 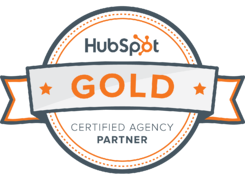 HubSpot not only offers an incredible product, they provide an online training program second to none." Although Asp had caught the inbound buzz, he had difficulty getting his website traffic up. He had started producing content regularly for the site and was seeing a slight uptick in organic traffic, but nowhere near what he had been hoping for. Running a business with multiple locations and producing all of the content for the website himself soon became too much for him juggle at once. He knew that in order achieve the results he was looking for, content production would have to become a priority. From May through October 2013 Asp hired a local media marketing firm to run his inbound campaign. And while the company was able to grow ASC's social media presence, organic traffic and leads continued to trickle in at a meager pace. Undeterred, Kevin still believed in the possibilities that inbound marketing promised. Asp had started listening to podcasts during his long commutes between Alaska Sleep Clinic's spread-out locations. It was during one of these trips that he first heard Marcus Sheridan of The Sales Lion speak. "I can vividly recall the first time I came across Marcus," Kevin says, "His energy and the way he communicated his personal story was very powerful. Little did I know he would be the catalyst for the adventure that would lead to ASC's success and my eventual founding of InboundMed." Shortly after hearing Sheridan speak, Kevin knew that he had to contract Sheridan to help his company with its inbound marketing efforts. The Sales Lion team's first resolution was to completely redesign ASC's website to make it not only SEO friendly, but easily navigatable for any visitor. The second, and most important step, was to hire the right person to handle all of ASC's content production and management. "Marcus helped me realize that I needed to hire a writer to produce content for my website," recalls Asp. On June 18, 2014, Asp hired Kevin Phillips, a recent University of Alaska Fairbanks graduate with a degree in English and a background in journalism and video editing. "Once I hired the right person it was magic," says Asp, "I truly believed having someone who could write well, and could share the vision and direction of where I felt the company needed to go was essential to our success." Under Sheridan and Asp's tutelage, Phillips began writing content with the most basic (yet hard to grasp for many companies) of principles: answering questions customers were asking. Within just a few short weeks of writing two to three blog articles a week, creating informative e-books, and fully fleshing out Alaska Sleep Clinic's website pages, organic traffic to the website began to see exponential growth. 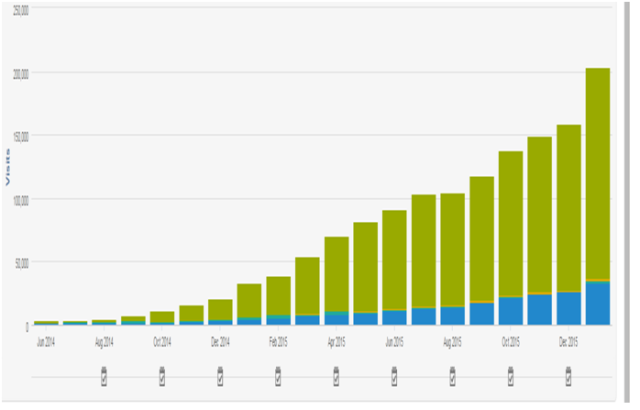 In a little over a 20 months, traffic to the website increased over 70 fold from 2,792 visits in June 2014 to 202,154 in January 2016. All of Alaska Sleep Clinic's success can be contributed to writing articles from the viewpoint of the patient and addressing their needs and concerns without overly promoting ASC's services. In the most basic of terms, each article Phillips wrote can be broken down as simple as "Here is a problem you may be experiencing, these are the possible causes of your problem, here are all of the available solutions, and if you would like our help solving those problems, we would be more than happy to help you." Not only was the success of the traffic, leads generated, and customers created from their inbound efforts remarkable, it was measureable. Unlike with traditional outbound marketing, inbound marketing using HubSpot's marketing platform can easily show where all of a website's traffic comes from: organic searches, referrals from linking websites, email marketing, social media, paid searches, direct traffic, and other campaigns. The frustration of not knowing the return on investment (ROI) from outbound marketing was one of the pain points Asp had been experiencing "Like many other people, I was spending the vast majority of my marketing efforts on traditional advertising," says Asp, "I was speding anywhere from 10-16 thousand dollars per month on TV and radio with some success, but it was a very manual process to prove ROI. I could only demonstrate ROI if a staff member actually asked each new patient how they heard about us and then it was difficult to determine which channel or tv show brought it to their attention." 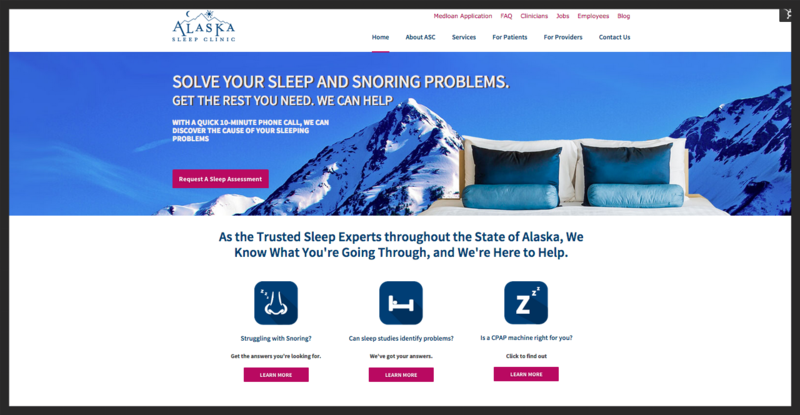 "By focusing all of our resources into inbound marketing and leveraging HubSpot's marketing software we built Alaska Sleep Clinic to be the most trafficked sleep center website in the world in just over 12 months time. "–Kevin Asp. Now after garnering success for his own businesses and a few other satisfied companies, Asp's new passion is teaching other medical practices how they too can harness the power of inbound marketing to attract new patients, educate leads, nurture relationships with clients, and ultimately grow their own business all by embracing the inbound marketing philosphy of provding patient education in place of traditional practice promotions. The Alaska Sleep Clinic was started by its founder, Kevin Asp, in 2002. He served as it's President from inception until he sold the company in April 2015. Please download the FREE ebook "The 30 Greatest Lead Generation Tips, Tricks & Ideas" by clicking on the icon below.